Single dad Beckett McKinley’s rambunctious twins ask their music teacher, Ella Baker, for help in learning their father’s favorite Christmas song. They want to surprise him by singing it at the children’s annual holiday show. On impulse, Ella agrees, but only if the boys will teach her how to ride a horse. She has long struggled with a phobia of horses with roots from her childhood. I admit I had to remind myself to suspend my disbelief in this—a teacher asking young boys to teach her to ride a horse seemed a bit silly . . . but it wasn’t as if she didn’t realize it was impulsive, and she wished she could take it back almost as soon as she said it. They were just so excited about the trade though. She didn’t have the heart to disappoint them. Beck has long been attracted to Ella Baker, the daughter of his neighbor and mentor, but his effort to keep his distance and hide his feelings has only made her think he doesn’t like her. She assumes it is because she grew up in Boston, not Cold Creek, and he, like her father, feels she doesn’t belong there. Ella has conflicting feelings about Beck—she is attracted to him and yet sees him as a rival for her father’s attention—and for her family’s ranch. I adored those twin boys. They had energy to spare, and ran their teachers and father ragged, but they have good hearts and are eager to do the right thing. I like Ella’s approach with them. While Ella has some things to overcome, like her fear of horses, her real conflict is with her father and his inability to see that she is willing and capable to learn how to run the ranch. Her father’s failing health is in part what brought her to Pine Gulch, a place she loved as a child. She wants to make it her home. Beck and her father see her being there only temporarily—her father still seeing her as a child he has to protect, and Beck seeing his former wife, also a city woman, in Ella despite the two women being completely different. I really liked Ella and Beck, both down to earth and hardworking people. Ella takes on her fear head on, and I loved that about her. She knows what she wants and she goes after it. Beck is still haunted by his past and has to get past that before he can fully let love in. The two characters have definite chemistry together. I enjoyed seeing the characters come into their own—and grow together over the course of the novel. I may have got misty-eyed at the end of this one—and in a few other places. This was a sweet romance—perfect for the holiday season. I only like books like this around the holidays. This one sounds like one I'd like. Kathy - It was a good one! I enjoy romance now and then, but more so around the holidays, I think. Lark - I really enjoyed this one and hope you do too! I don't normally read romance, but I could see myself getting into this one, especially around the holidays. Loved your review! Suzanne -Thank you! I really enjoyed this one. I enjoy romance novels every once in a while so this is one I need to keep on my list! I thought I had read this one but I haven't! 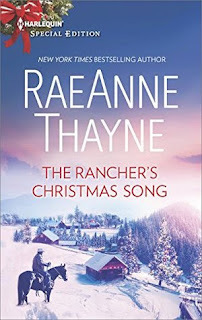 I don't know if I'm disappointed or happy that there's another RaeAnne Thayne Christmas book for me to read. I think her's are the best. They're always so sweet without quite getting to sappy. Katherine - Haha! It's hard to keep up. I agree. Her romances are among my favorites.